Chairman Xi Jinping places high importance on this meeting, has sent a special letter of congratulations, expresses warm congratulations on the opening, and expresses a cordial welcome to each honored guest. He wishes for accelerated common development of the digital economy and sent a very important letter of congratulations. I wish to amply express Chairman Xi Jinping's deep insight into trends in the development of the global Internet and order in cyberspace; his accurate grasp of cyberspace development administration and regulation; and his sincere wish that China and the world can develop the Internet and digital economy hand-in-hand. In recent years, Chairman Xi's important concepts of cyber sovereignty, a community of common destiny in cyberspace, etc., have been deeply impressed on everyone's mind and gained broad approval and positive responses from international society. Cyber exchanges at the United Nations, APEC, the G20, etc., have continuously deepened their roots. Global cyber infrastructure construction has picked up pace. The digital economy has become the new driver of global economic growth. Online cultural exchange and sharing has increased. Cybersecurity has progressively deepened. Global cyberspace governance has progressed toward a more fair and rational direction. Ladies, gentlemen, friends: Not long ago, the Communist Party of China opened the 19th National Congress. The Congress firmly established Xi Jinping's thought on Socialism with Chinese Characteristics for a New Era as a new guiding rule of the Communist Party of China. It set a program of action and a development blueprint for continuing and developing socialism with Chinese characteristics in a new era. 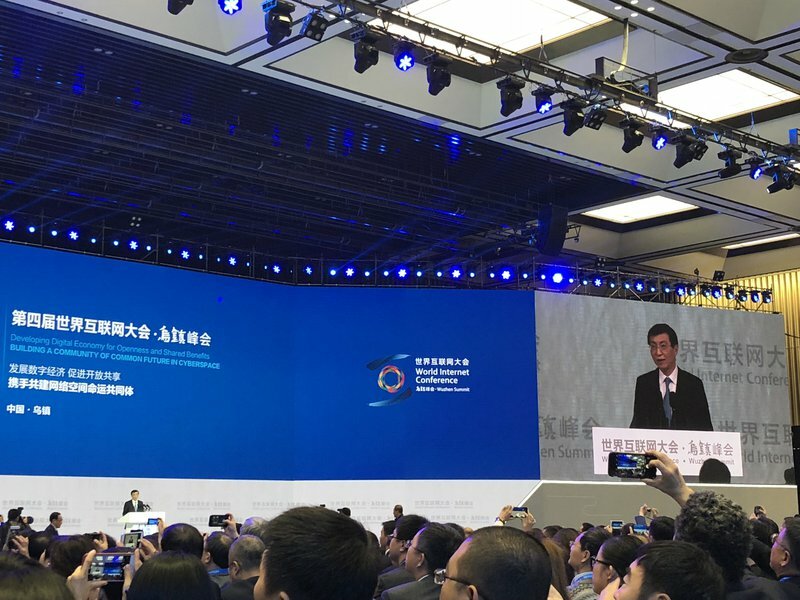 In his report, General Secretary Xi Jinping deeply expounded on continuing down the path of peaceful development and promoting the construction of a community of shared destiny in cyberspace. He also expounded on this during the recent APEC informal leadership meeting and other international fora. General Secretary Xi Jinping emphasized the need to advance the building of a community of common destiny for humankind; to build lasting peace, universal security, common prosperity, openness and inclusivity, and a clean and beautiful world; to advance the new world program toward a more open, inclusive, balanced, mutually beneficial, win-win direction of development; to deepen Internet and information technology, build a cyber superpower, and advance society through a digital China; and to advance Internet, big data, artificial intelligence, and data economy, etc. (emphasis added). Xi Jinping has given not only new objectives for important thought on China's political and economic Internet development, but also new impetus to cyber cooperation between China and the nations of the world. The theme of this conference is "Developing Digital Economy for Openness and Shared Benefits, Building a Community of Common Future in Cyberspace." This is a very important theme. When we established this theme, we hoped to seize important opportunities brought by the Internet: the digital economy as an important driving force; promoting cyberspace openness, cooperation, exchange, and sharing; allowing the Internet to better assist economic development, social progress, and improved life; and achieving the promotion of common development, common security, common participation in governance, and common sharing. I would like to propose five points for everyone to consider together. Second, we should promote openness and cooperation and expand of space for development. Openness is the foundation of the Internet. Open sharing is the necessary path to build a community of common destiny in cyberspace. Studies show that in the past 10 years, global cross-border data flows have increased by 45 times. Data and information have made an important contribution to development. We should give play to data as a key factor of production, and more broadly and deeply promote an open, sharing flow of data resources, so that the full value of data and information can be realized. We should deepen opening and cooperation in the Internet domain, building a mutually beneficial and win-win online market, creating more points of common interest, and growing cooperation and win-wins. General Secretary Xi Jinping has emphasized in his work report [to the 19th Party Congress] that opening up has brought progress while closure has brought backwardness. In his letter of congratulation on this occasion, he emphasized that the door of China’s opening will not be closed, but will only open wider. During 40 years of China’s reform and opening up, China has always adhered to the basic pattern of opening to the outside world and has taken a courageous move toward the world, always extending its warm welcome to the world. In 2012, China's trans-border e-commerce transaction volume was only 2.1 trillion yuan. In 2016, it had reached 6.7 trillion yuan, more than doubling in size over four years. China will promote the Internet and the digital economy, properly implement the Internet and digital economy line and the APEC Cross-Border E-Commerce Facilitation Framework, and focus on the Belt and Road Initiative, to strengthen cooperation on the data economy, so as to make the achievements of the Internet greater and to better bring countries together. China will perfect the legal system, optimize the policy environment, and [inaudible]. We sincerely welcome Internet companies and founders from all countries to invest in China and hope that the markets in various countries will further open up to Chinese enterprises. Third, inclusiveness and sharing. It is our development goal to let the people of all countries worldwide equally use the Internet and share in the fruits of Internet development. In 2016, global Internet penetration was only 45.5%. We should accelerate Internet penetration, enhance the construction of information infrastructure, pave smooth information roads, and continually reduce the digital divide between countries and peoples. We should make the Internet into an important channel to improve people's livelihoods; develop online education, long-distance healthcare, and online culture in great numbers; continually provide digital products and services that people can use, can afford to use, and can use well; and give the popular masses a sense that they share in the fruits of Internet development. China is willing to, together with all countries worldwide, create conditions for the peoples of all countries to equally participate in the development of the global data economy; to be an important driver in developing the inclusive, cooperative, and tolerant nature of information technology; and to promote development of economic globalization in a direction of more efficiency, more fairness, and more rationality. Fourth, we should strengthen coordination and linkages, solidify mutual engagement, and join forces. There are no bystanders in global Internet development and governance. Everyone is a participant. Everyone's affairs should be handled through common consultation. We should strengthen coordination and linkages concerning policies, laws, norms, and standards for the Internet and the digital economy; advocate exchange and contributions; formulate international norms and standards that are ever more equal and reflect the interests and concerns of all sides; resolve the problems of imbalanced structures, policies, and standards; reform aspects of existing Internet norm systems that are unfair or irrational; and muster forces from all sides and of all kinds. This creates conditions for international norms that reflect all sides' interests in a more balanced manner, and for all countries to equally participate in global Internet development. We should advocate, on the basis of respect for cyber sovereignty: strengthened cooperation in cyberspace; communication about trade, infrastructure, and people's livelihoods; giving full play to the role of those Internet enterprises, civil bodies, individual citizens, etc., from all countries, who advocate coordination and linkages between all sides; and concentrating people's efforts in shared results. The digital economy is an important breakthrough point to move forward reform of the global Internet governance system, and a crucial force in building a community of common destiny in cyberspace. China is willing to, together with international society, formulate and perfect norms and standards in areas such as cross-border e-commerce and cross-border data flows (emphasis added). China promotes the construction of global data economy value chains, the stimulation of coordinated and linked development, and the realization of common prosperity. Fifth, we should stimulate security cooperation, and build a good order. The problem of cybersecurity in today’s world broadens continuously. Cyber attacks, cyber crime, cyber terrorism and other such cybersecurity problems are continuously propagating in their interlinkage, gravity, major power nature, and specialization. For the entire world, realizing security in cyberspace is one foundation of building a community of common destiny in cyberspace. We should establish a consciousness to collaborate on cybersecurity challenges, persist in stimulating development through security and peace, strengthen strategic dispositions, strengthen communication and consultation, promote cyber information sharing, and establish normalized emergency response mechanisms. We should, according to the law, attack online fraud, online infringement of property and citizens' privacy, and other such unlawful and criminal activities online. We must especially combat new criminal opportunities on the Internet; strengthen judicial assistance concerning cybercrime; and safeguard national security, the public interest, and the lawful rights of citizens. China is willing to establish and complete supervision and management mechanisms suited to the development of the digital economy with leaders of all countries, to jointly prevent risks and challenges brought about by the high-speed development of the digital economy, and build a secure, stable and prosperous cyberspace. Chairman Xi Jinping indicated in his congratulatory letter that China's digital development will enter the fast lane. China hopes to, through its own efforts, back all countries worldwide to jointly send forth the speedsters of the Internet and digital economy development. China is a major cyber nation with 700 million netizens. Even though China is a major driver of the development of the global Internet, it is also a builder of peace in cyberspace, a contributor to development, and an upholder of order. China is willing to, together with all countries worldwide, strengthen dialogue and exchange, deepen pragmatic cooperation, jointly expand the cake of digital economy development, jointly promote the construction of a community of common destiny in cyberspace, and let the Internet enrich humanity in an even better manner.